II have always had an interest in theatrical productions so what better than to link the science and arts, yes real STREAM. I always maintain that this material is not for reading but for performing to the class/on stage/assembly etc. Although it went down like a lead balloon to the class, it was always enjoyable to do and gives the teacher that notoriety of the ECCENTRIC, which make it stick in the minds of students. 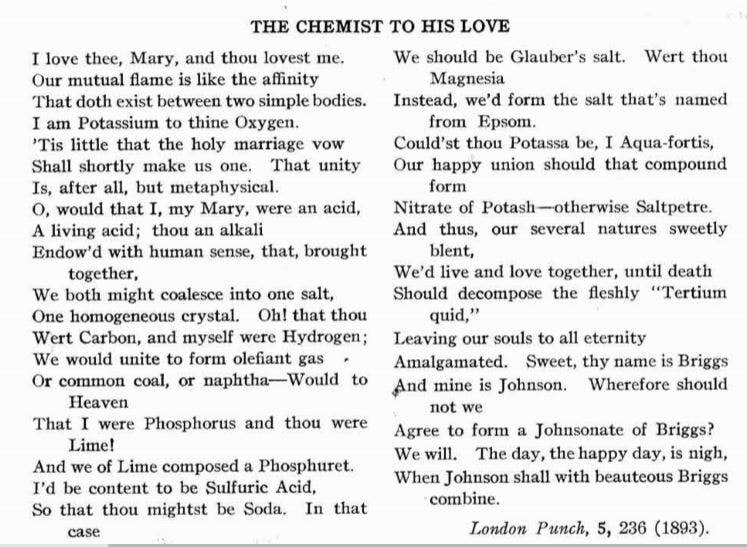 Published in Punch in 1843 and printed in the 1932 Jiournal of the Chemical Education. 33 The first day it was my fate to be assigned the preparation of zinc sulfate: it should not have been too difficult; it was a matter of making an elementary stoichiometric calculation and attacking the zinc particles with previously diluted sulfuric acid: concentrate, crystallize, dry with the pump, wash and recrystallize. Zinc, Zinck, zinco; they make tubs out of it for laundry, it is not an element which says much to the imagination, it is gray and its salts are colorless, it is not toxic, nor does it produce striking chromatic reactions; in short, it is a boring metal. It has been known to humanity [outside India!] for two or three centuries, so it is not a veteran covered with glory like copper, nor even of those newly minted elements which are still surrounded with the glamour of their discovery.